Kona Kava Powdered Root Plus (8 ounces) Our strongest Powdered Kava Root has matured for over four years, has a tested kavalactone content of about 10%, and is offers a less bitter taste and most pleasurable effects. * We are proud to boast more returning customers than any other kava farm we know of; a testament to the purity and strength of our 'Awa (Kava). Our Premium Kava Kava root is the pride of our family farm, and we offer our 100% Satisfaction Guarantee to any customer who doesn't think our kava is the best they've ever tried. Directions: 2 tablespoons 3 times per day. Do not exceed 2 tablespoons per serving. Daily dosage not to exceed 6 tablespoons. Maximum period of daily use: 3 months. Use may resume for 3 months after a 2-week break. Kona Kava Powdered Root Plus (16 ounces) This is the 16oz package of KKF Powdered Root Plus Premium Kava. Premium Noble Kava Root Powder (4oz) OUT OF STOCK - DO NOT ORDER! Our Premium Noble Kava Root Powder has matured for over four years and is our strongest form of Kava root available. Our Premium Noble Kava Root is prized for its least bitter taste and the most pleasurable effects. * This root is a little pricier than our other Kava Root, but the 14%-16% kavalactone content is partly the reason, and it's one of the sweetest-tasting Kava Root powders we have ever tried. We literally tried Kava from all over the world; from Hawaii, Fiji, Vanuatu, Tonga, New Guinea, and even Germany. We chose our favorite Noble Kava Powder out of all of them, and are proud to ship it anywhere in the world. Available only in small quantities, and always blended with Noble Kava root from Hawaii. Directions: 1 tablespoon 3 times per day. Do not exceed 1 tablespoons per serving. Daily dosage not to exceed 3 tablespoons. Maximum period of daily use: 3 months. Use may resume for 3 months after a 2-week break. In Hawaii, there is a cultivar of Kava that has been long revered due to its "strong cerebral effect". This is because the kavalactone called kavain is the predominant kavalactone. This sacred variety was so important to them that no one but royalty could ever experience it, "lest they suffer an untimely death". We want to make these ancient and sacred cultivars available to everyone, and are extremely proud of that particular variety that has made Kona Kava Farm famous. Often out of stock, available only in small quantities, and always blended with other Noble Kava root because of its scarcity. Caution: If using prescription medications, seek the advice of a health care professional before using this product. Not to be taken during pregnancy or if breastfeeding. Not for use by persons under the age of 18 years or with alcoholic beverages. Keep out of reach of children. Used in excess or with substances that induce drowsiness, the ability to operate heavy equipment or a vehicle may be impaired. Premium Noble Kava Root Powder (8oz) OUT OF STOCK - DO NOT ORDER! is our 8oz package of Premium Noble Kava Root Powder from Kona Kava Farm. Premium Noble Kava Root Powder (16oz) OUT OF STOCK - DO NOT ORDER! This is our 16oz package of Premium Noble Kava Root Powder from Kona Kava Farm. EasyStrain Instant Kava Mix (4oz) a delicious supplement to help relax and ease the mind,* our new EasyStrain Instant Kava Mix contains a blend of all-natural ingredients, including a standardized extract of kava, soy powder, cane sugar, and our proprietary flavor blend. Made from a Noble Variety of Kava, this is beyond a simply micronized Kava. This product has carefully had 92% of the rough root material removed, concentrating the Kava, and making it blend well and stay suspended in water! Instructions: For each serving, simply put 2 rounded teaspoons 125mL (4oz) of water, stir thoroughly. A blender works best for mixing (3 minutes). After blended, choose to strain if you wish, or simply enjoy your EasyStrain Instant Kava as it is. EasyStrain Instant Kava Mix (8oz) is the 8-oz EasyStrain Instant Kava Mix package. Instant Kava Powder Mix - Banana Vanilla (4oz) Kava Farm is an organic farm nestled in the heart of the fertile slopes of Hawaii’s Hualalai Mountain, world renowned as the Kona Coffee Belt. This area is prized for its unique micro-nutrients and perfect climactic conditions, producing the taste essences of the tropics. We specialize in ‘Awa (Kava) nurtured with fragrant breezes and tropical sunlight, harvested only at the peak of potency, and then dried naturally by the sea. We use 90% underground root and 10% lateral roots for our Kava Kava, with no added stems, leaves, or fillers of any kind. For a delicious supplement that naturally promotes relaxation and helps ease the mind from daily stress,* this Instant Banana/Vanilla Kona Kava Drink contains a blend of all-natural ingredients, including a standardized 4:1 extract of kava, plus banana powder extract, vanilla bean powder extract, chocolate powder extract, vanilla liquid extract, and pineapple powder extract. Directions: 2 teaspoons (0.5 oz) twice daily. Daily dosage not to exceed 4 teaspoons (1 oz). Maximum period of daily use: 3 months. Use may resume for 3 months after a 2-week break. Instant Kava Powder Mix - Banana Vanilla (8oz) is the 8-oz Instant Banana Vanilla Kava. Instant Kava Powder Mix - Cocoa (4oz) Kava Farm is an organic farm nestled in the heart of the fertile slopes of Hawaii’s Hualalai Mountain, world renowned as the Kona Coffee Belt. This area is prized for its unique micro-nutrients and perfect climactic conditions, producing the taste essences of the tropics. We specialize in ‘Awa (Kava) nurtured with fragrant breezes and tropical sunlight, harvested only at the peak of potency, and then dried naturally by the sea. We use 90% underground root and 10% lateral roots for our Kava Kava, with no added stems, leaves, or fillers of any kind. For a delicious supplement that naturally promotes relaxation and helps ease the mind from daily stress,* this Instant Cocoa Kona Kava Drink contains a blend of all-natural ingredients, including a standardized 4:1 extract of kava, plus soy powder, sugar, cocoa powder, cinnamon powder, and nutmeg powder. Instant Kava Powder Mix - Cocoa (8oz) is the 8-oz Instant Cocoa Kava. 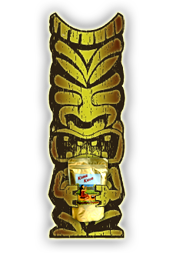 Instant Kava Singles (BanVan 6pk) These are the Instant Kava Singles 6 pack, Banana/Vanilla flavor. These revolutionary (really) Instant Kava Singles are unlike anything else in the marketplace! Over a year in development, we've finally come up with an extract that not only easily dissolves in water, but is so concentrated, only a small single packet is required. These have become "instant" hits here at Kona Kava Farm. Takes the mess and the fuss out of getting your daily dose of Kava. Available in our usual 3 flavors; Organic Banana/Vanilla, Organic Chocolate, and Organic Tropical, these on-the-go packets are great for an instant Kava experience anywhere. Put them in lunches, keep them in a backpack, or simply have them waiting when you get home from work, for the easiest, but strongest Kava experience available, with the least amount of mess.